We understand that choosing to receive orthodontic care is a big decision, and we would love for you to give our office an opportunity to wow you with a uniquely wonderful orthodontic experience! The Howell Orthodontics team will work with you every step of the way to make sure that your orthodontic care is as rewarding as possible. Our practice utilizes the latest technology, offering a variety of safe and gentle treatment options to give you the customized, individual care you deserve. Your initial consultation will give you the opportunity to meet our team, learn more about orthodontics, receive a complete initial exam, and find out which treatment options will best meet your needs. 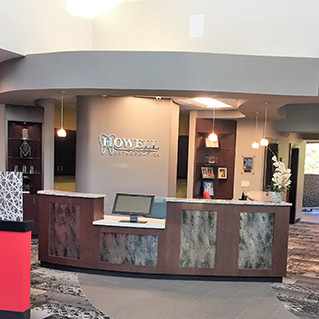 During your initial consultation, Dr. Howell will review your dental and medical history forms, perform a complete oral exam with digital x-rays, and determine whether treatment is necessary now or later. If treatment is necessary now, Dr. Howell will create a customized treatment plan and our treatment coordinator, Ruth, will discuss all financial information, insurance options, and payment options that can be customized to make sure we have a plan that fits within your budgetary needs. You're one step closer to achieving the smile you've always wanted! After your consultation, we will schedule your first appointment for Dr. Howell to start your orthodontic treatment. This appointment generally takes about an hour, and during this time our team will be available to make sure that you are as comfortable as possible. We understand that “life happens!” If you're running late or need to reschedule, please let us know, and we will do everything we can to accommodate you.